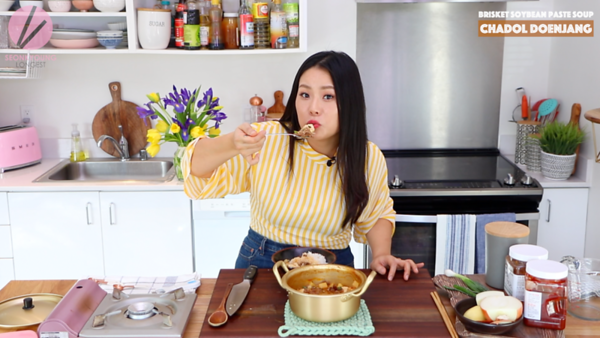 Chadol means beef brisket and Doenjang means Korean soybean paste. 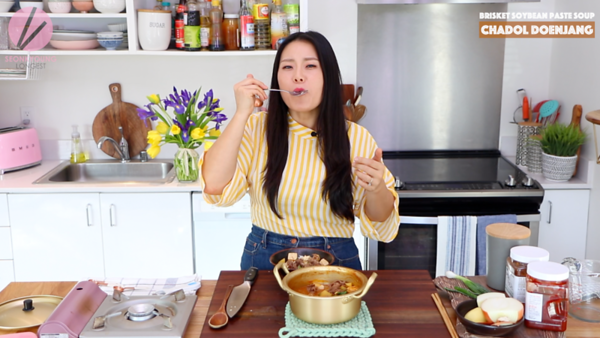 So Chadol Doenjang is beef brisket soybean paste soup. It’s thick, savory, spicy goodness with beefy brisket flavor, it’s amazing!! 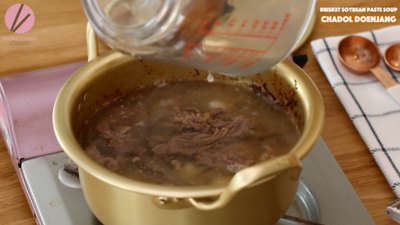 Heat a minute size pot over medium high heat; add beef and sauté until it release its fat, about 2 to 3 minutes. 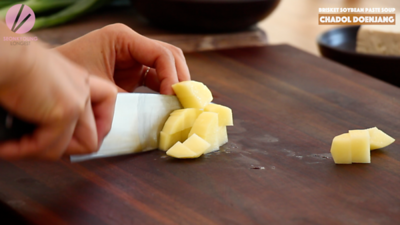 Cube some potato and onion into 1/2-inch and add into the pot and sauté 1 to 2 minutes more. 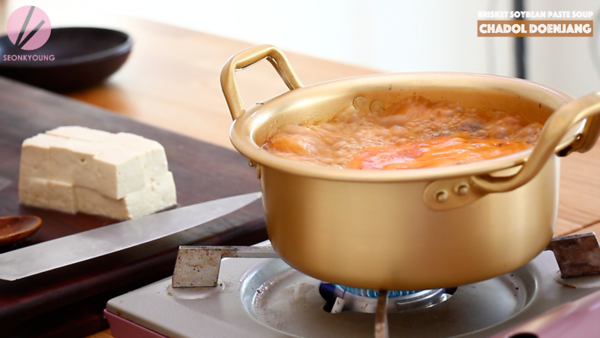 The pot I used in this recipe is known as Korean Noodle Pot, 18cm. I got it from local Korean grocery store, but I linked to the online where you can buy (tap the picture!) just in case if you don’t have one near you. 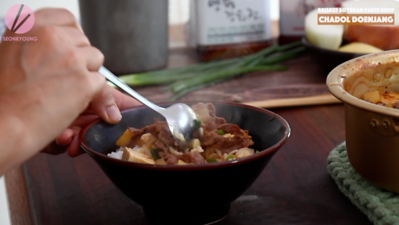 Pour water and add Korean beef bouillon AKA Dashida or regular beef bouillon, doenjang, gochujang and gochugaru. Picture above is my favorite doenjang & gochujang from Korea and I’m lucky enough to get these in Sacramento California. But you don’t have to use the same brand, you can always use any brand that you can find at your local Asian grocery stores. Also, if you want to make this mild, your can substitute gochujang with doenjang and omit the gochugaru, the red pepper flakes. 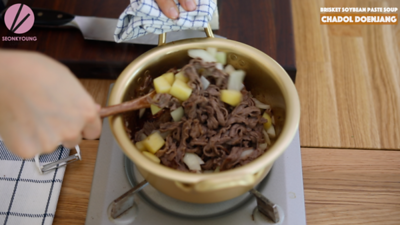 Mix well until everything is well combined and no chunks of the doejang or gochujang. Bring it to boil. 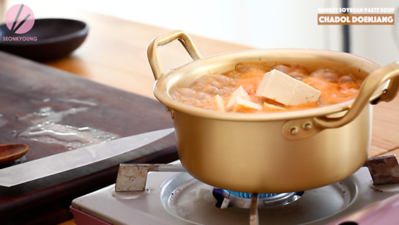 Add tofu and bring back to boil. Keep boil for 6 to 8 minutes or until the potato is fully cooked. 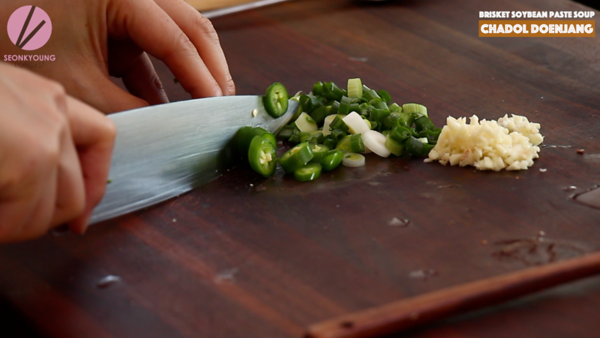 Meanwhile, chop some garlic, green onions and serano chili. 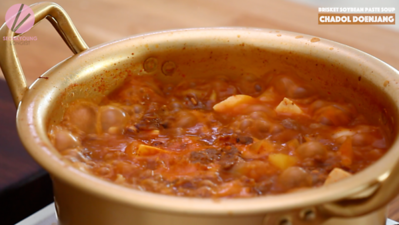 Omit the chili if you want to keep this mild. Add chopped garlic, green onions and chili. 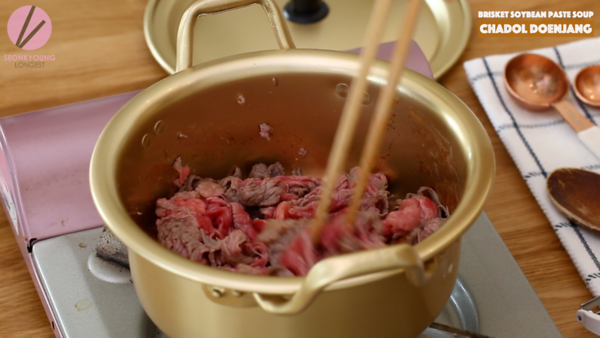 Remove from heat and serve immediately with bowl of warm cooked rice and other Korean side dishes as you like. 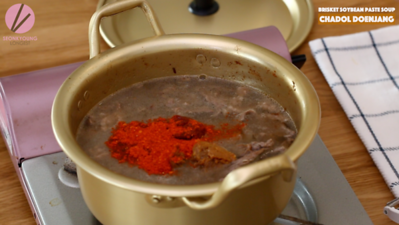 Heat a minute size pot over medium high heat; add beef and sauté until it release its fat, about 2 to 3 minutes. 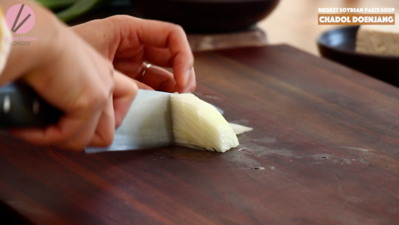 Add potato and onion into the pot and sauté 1 to 2 minutes more. 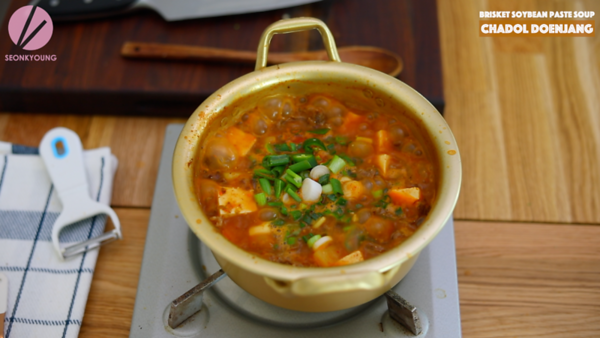 Pour water and add bouillon, doenjang, gochujang and gochugaru. 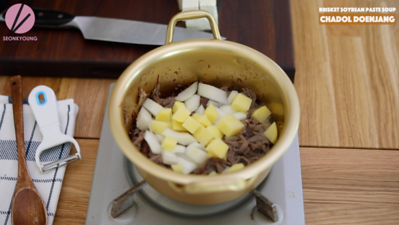 Mix well until everything is well combined and no chunks of the doejang or gochujang. Bring it to boil. Add chopped garlic, green onions and chili. 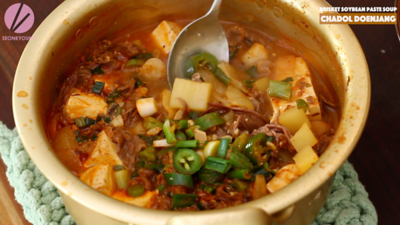 Remove from heat and serve immediately with bowl of warm cooked rice and other Korean side dishes as you like. Enjoy! What a wonderful looking dish. Can’t wait to make it! Thanks, Seonkyoung! Is there a way to download your videos for offline viewing at a later date? I just made this. It’s delicious.